Are you afraid your Jaw Pain is a sign of something Serious going on? Jaw pain after fillings isn’t something to worry about. In most cases, it’s a temporary reaction to the treatment or a side effect of the anesthesia that prevents you from biting down correctly. Cavities don’t necessarily cause pain either, which is why it’s so important to get regular check-ups. Not experiencing pain doesn’t mean your teeth are cavity-free. The only instance when cavities do cause pain is when they’re deep enough to touch the nerve. But the pain caused by the nerve will disappear completely after a root canal treatment. Knowing all this, let’s take a look at everything you need to know about jaw pain after fillings! The numbness can cause modifications to the way you bite down. For a few days, you may feel some discomfort and pain until you get used to the new bite. 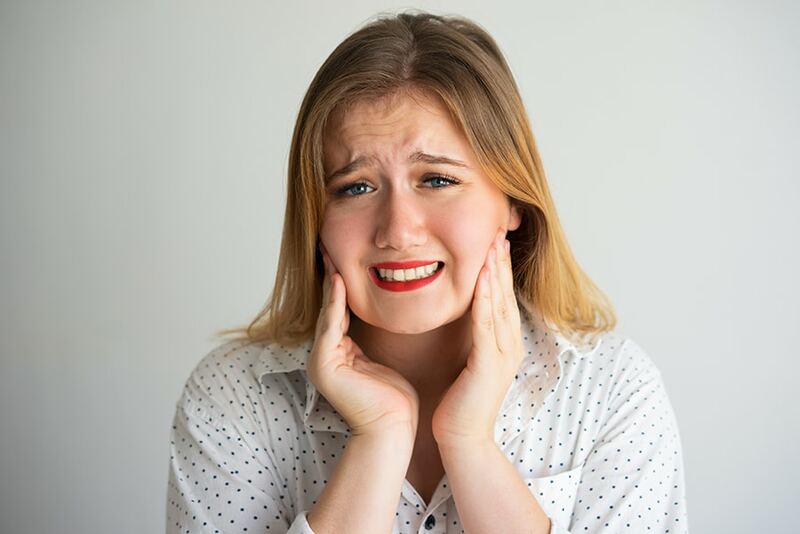 The solution is a simple procedure called bite adjustment, which eliminates the pain and discomfort by polishing the teeth and adjusting the new filling so it fits perfectly. This might sound scary, but it’s a fairly normal reaction to dental work, especially if you suffer from sensitive teeth. In this case, inflammation appears as a reaction to the dental work, but in most cases it’s a normal part of the healing process. If you had a deep cavity, because it was closer to your nerves that trigger inflammation in the first place, you have a higher chances of experiencing pain for a few days. However, if the pain is sharp and lasts more than a few days, you might be experiencing chronic inflammation. This type of inflammation will require pain management medications along with a root canal to fix the sensitivity issue as well. The longer the procedure takes, the higher the risk of myofascial pain and difficulties opening and closing the mouth, along with stiffness. This is a normal reaction caused by the stress put on the muscles of your face, and it requires no treatment. The pain and stiffness will go away on their own. If you do find the pain a bit overwhelming, you may benefit from anti-inflammatory painkillers. The risk of experiencing jaw pain is higher if you have a habit of grinding your teeth, since your muscles are probably already overused on a daily basis. Going to a dentist puts even more pressure on them. Silver fillings are not as aesthetically pleasing and can damage the tooth in the long term because the material itself is harder than the enamel. However, if you believe you are suffering from extremely sensitive teeth, you should be aware silver fillings are less likely to cause an inflammatory reaction compared to composite fillings. Silver fillings might not be as aesthetically pleasing, but if pain is a concern, you could give it a try since it the procedure takes less time to perform as well. This type of filling is also known to be less expensive than its alternatives. The only downsides to these fillings are the aesthetics, the sensitivity to alcohol, and the fact that it contains small quantities of mercury that are released each time you chew on food. On the other hand, composite fillings may lead to jaw pain because the procedure takes longer and your jaw muscles will be put under a lot of pressure, but the final result will be more aesthetic. There is no mercury in composite fillings, and you won’t have to worry about consuming alcohol. If you fear that you have a sensitivity, ask your dentist about what option is the best investment for you.